The 4400 corn headers are designed to handle increasing corn yields and tougher corn plants. With the increased productivity of the Axial-Flow combines, the double roller chains run in an oil bath, to operate the row units in 8 and 12 and 16 row corn headers. It gives them the ability to handle the toughest and heaviest crop conditions at the maximum reliabilty. The row unit gearboxes themselves are a heavy-duty design, with the main gear box housing made from aluminum for reduced header weight. All row units are slip clutch protected and run in an oil bath for quiet running and high reliability. 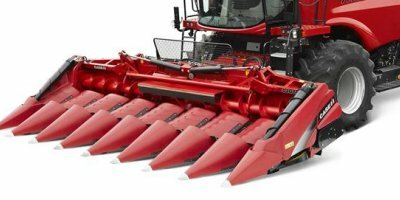 No reviews were found for Case IH - Model 4400 Series - Corn Heads. Be the first to review!